Remember when we write about our email marketing revolution? That our platform allows you to send the right message to the right subscriber? 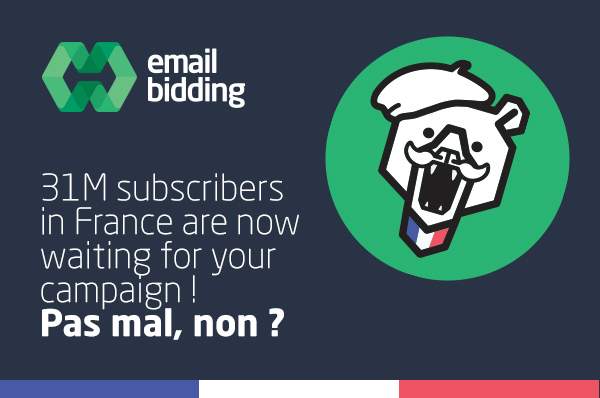 That’s right, in France we now have 31 million active subscribers on Emailbidding! Thanks to our publishers’ network, your message can have a better reach in this country. The coolest thing about this is it only relates to potential sending emails. There are other features on the platform that puts Emailbidding at the forefront of digital marketing! We could describe them all, but it would be too much marketing for you. Besides, it’s better to find them for yourself, creating your own campaign! “Yeah, but I don’t want to send it to France”, you’re saying. Don’t worry, our publishers’ network is awesome enough for you to send your campaigns to other countries. So, why you’re still reading this? Get in touch with us and join the email marketing revolution!